Kenyan MPs have passed a bill with an overwhelming majority to nearly halve the number of ministries from 40 to 24 in a bid to cut costs. The 42-member cabinet and the more than 50 assistant ministers have come in for criticism from taxpayers. The cabinet was formed last year after a power-sharing deal was brokered by international mediators to end deadly post-election ethnic violence. The bill must be signed by the president before it becomes law. 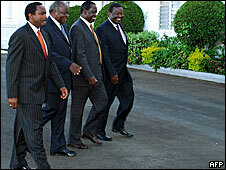 If approved by President Mwai Kibaki, it would take effect in the next parliament. During the debate, MPs said the bloated cabinet, which also includes the president and prime minister, had made it ineffective, Kenya's Daily Nation newspaper reports. "I was embarrassed when a minister asked me the name of a colleague who was just seated on the opposite side of the house," MP and Sports Assistant Minister Kabando wa Kabando is quoted as saying. "This showed even ministers don't know each other as their number is too big." He said President Kibaki and his former political rival Prime Minister Raila Odinga were being held hostage to ethnic and regional interests and a trimmed cabinet would help reduce tribalism. About 300,000 people were forced from their homes - and 1,500 killed - as violence erupted after the disputed December 2007 presidential election. The proposed law would also require ministers to have a university degree and be vetted before their appointment. The BBC's Caroline Karobia in Nairobi says as it stands ministers must be an MP and have passed a language literacy test. After the power-sharing accord last year, correspondents estimated that the salaries for ministers, assistant ministers and the new prime minister and deputy prime ministers posts would cost the Kenyan taxpayer $1.5m (£907,000) a month.